Sitting for long hours can be harmful in the long run. Sedentary lifestyle and poor ergonomics can cause a number of problems, including back pain. Ergonomics can modify a workplace into a comfortable one for the worker, minimizing discomfort and fatigue. Sitting in a position for long hours, we tend to develop a natural tendency to slouch over or down which can strain spinal discs, over-pressuring the shoulders and back muscles. Hence the chairs were made adhering to ergonomics and cater to this issue of back and neck pain. There is a wide range of ergonomic chairs available in the market these days, however, we will take a look at the top ten chairs. Pricing is high when you want a find a good ergonomic chair because of the amount of research and time spent developing it. Buying a costly chair might sound silly but keep in mind it’s properly designed and will be durable for years to come whereas the cheap one may cost you less initially and are never that comfortable or durable. Hence you’ll end up spending more repairing or replacing it often. There are also other factors than price to be considered before buying a good and well built ergonomic chair. There are a number of features to be taken into account as well. Are kneeling chairs good for lower back pain? A good ergonomic chair supports your back and promotes a good posture. They include all if not most of the following features. 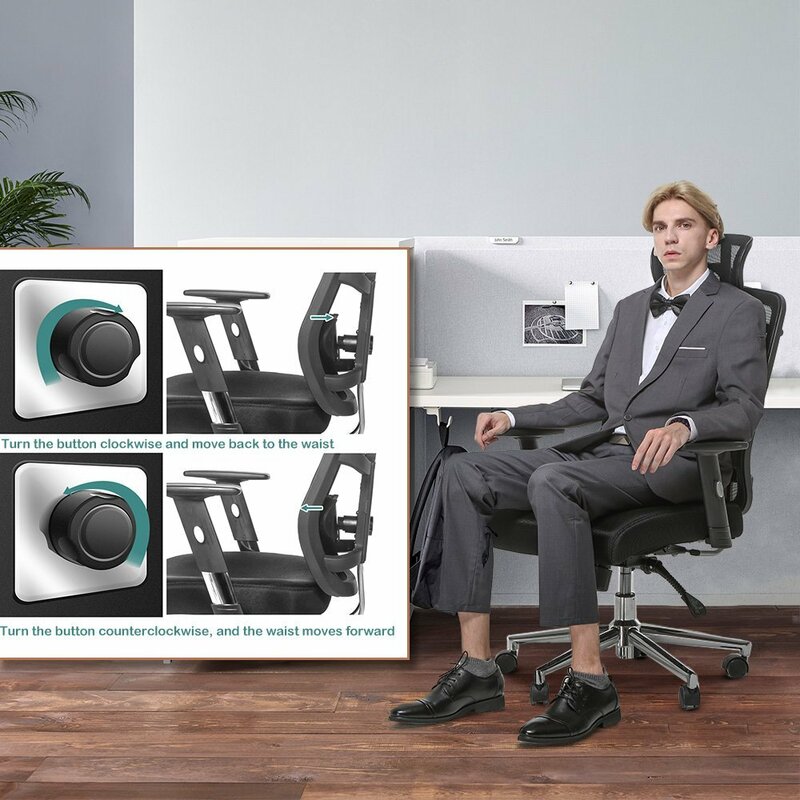 Adjustable seat height and armrest: With height adjustable chairs you should be able to sit with your feet flat on the floor and thighs at a horizontal position. With armrest being able to adjust, your arms should rest comfortably and be even with the height of the desk while your wrist should be flat while typing. 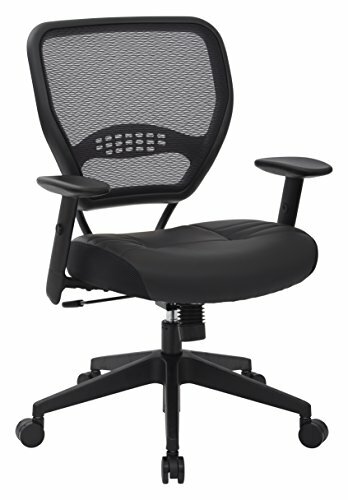 Adjustable Lumbar and seat depth: A good ergonomic chair must have a great lumbar support. See that the chair is not only adjustable in height but also in depth for your lower back. Lumbar support can either give you great comfort if it’s in the shape of your body or it can create more pain too. The chair is said to have a correct seat depth if the back of your knees does not touch the seat pan and your back is fully supported. Movement: Most people do not consider movement but it actually plays an important role because your chair should be able to swivel in order to reach different areas of the desk without straining you. A chair with five legs is better to roll without much effort. Design: Mesh back chairs are more comfortable than other materials like the leather or cushions as the mesh takes the shape of your body and can flex and form around you back while the others can’t. Similarly, a waterfall seat edge design chair is better as it reduces the pressure on your legs and encourages a healthy blood circulation. We have a wide range of products on the market but we have listed the top ten products for you to choose from. The Herman Miller Aeron chair is a very well made and comfortable chair that is expected to last for many years to come. It’s was originally designed by Don Chadwick and Bill Stumpf in 1992. 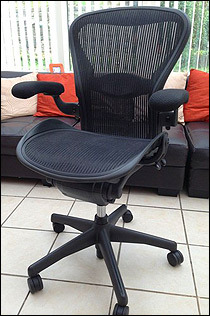 It’s also been called the best selling chair in America as of 2010. This chair is so popular that it has a permanent place in Museum of Modern Art in New York. It is made of a sheer and resistant fabric called pellicle and has a 12-year warranty. It is made of 53% recycled materials and the chair itself is 94% recyclable. As far as the seating options go the build quality is solid and feels well constructed. The usual height adjustable option is on the right with the paddle-shaped lever adjusting up or down. The height of arm on either side of the chair can be adjusted by simply lifting a lever at the back of the arm up and after setting the desired height locking it in place. The angle of the arm can also be adjusted in or out by simply holding it in the front and pivoting it. The tilt tension can be adjusted with a knob on the right-hand side. Rotate the knob clockwise to increase the tilt tension and a counterclockwise turn will decrease the tilt tension. The tilt tension makes it harder or easier to tilt when seated. Also, the tilt can be limited by adjusting the lever on the left. To control the forward tilt, tilt forward and move up the front lever and to reverse it tilt backward and move up the back lever. You’ll be able to tilt but within the set range. Adjust the lumbar support up or down with your hands to get right place for your back, it’s there to support the natural curve of your spine. It can also be pushed in or out by turning the knob on the right. The lumbar pad can be removed and turned over as it’s thicker on the other side allowing you to modify your depth. In addition to these adjustments, there are different materials in which its available. A graphite base with graphite frame, a titanium base with a smoke frame, a polished aluminum base with graphite frame. There are also a few different fabric options available so you can customize your chair. 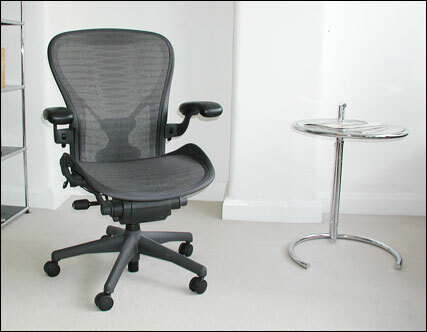 Aeron chair comes in three sizes A- small, B-medium, C- large for you to choose from. One of the secrets of success of Aeron chair is the material they used in it. Don Chadwick a prodigy of material design worked closely with manufacturers to invent a fabric called pellicle. The fabric Pellicle was designed capable of bearing such loads for long period of time. The chair was made out of 53% of recycled materials and the chair itself was recyclable up to 94% which consists of plastic and composite materials. With updates like more refined built tilt mechanism, adjustable posturefit SL and 8Z Pellicle suspension the chair has incorporated two decades worth of technological and ergonomic performance capabilities. The innovative suspension by pellicle material, eliminated circulation-restricting pressure points and stretched the boundaries of materials design. 8Z pellicle pushes it even further across the seat and back with 8 latitudinal zones. These zones are of varying tension as they are tightest at the edges and more relaxed where the body makes contact and improves the comfort and ergonomic support for the person sitting in it. By getting rid of the foam and fabric, Aeron chair solved one of the biggest problems of sitting in a posture for hours, the heat build-up and humidity close to body. While many chairs have adopted mesh to cater with this issue, pellicle allows body heat, water vapour and air to pass through the seat maintaining a cool temperature. The body is considered to be strongest when it’s in a standing posture (chest open and pelvis tilted slightly forward) it’ll be better off sitting that way too. Posturefit SL does exactly that by adjusting individual pads and support the lumbar region. All the enhancements of the chair are designed to work together in order to give the most comprehensive support to the human body. Together Posturefit SL and 8Z pellicle create total spinal support that moves the skeletal system into a position that provide ultimate support both when sitting still and active. This kind of active support is provided even when reclined. Through the updated tilt mechanism to ensure users are of at in their at most comfort be it any position as staying in one position reduces natural pumping action of muscles that provide nutrients to the spinal discs. A seamless shift enables people to shift from upright to full-recline smoothly. In the remastered version the frame angle has been adjusted 1.8 degrees forward for better support of the body across wide range of postures. The main point is to expose the Sarah chair’s mesh structural support and the idea that mesh fabric would prevent pressure points that caused heat build –up and long term discomfort for people who sit in office for hours together. The Iconic form has remained largely unchanged, the Aeron chair has been remastered from the casters up. With the introduction of the Aeron chair, its designers proved that a chair doesn’t have to be boring or just something for you to sit in it. Instead they designed in a way, by sitting in it can actually be better for your health. Aeron’s cross performance design helps it to be used by people in a wide range of environments, from forward-facing office activities to relaxed contemplative recline while watching a movie at home it suits a wide array of functions. Aeron comes is three sizes A (small), B (medium) and C (large) to provide comfort and that inclusive fit based on ends-to-the-middle approach because one size does not fit all people. Aeron comes in three colour palettes after various testing. Graphite being the darkest and resembling the original Aeron. For people who want a balanced and neutral look that works well in warm and cool environments equally. Finally the lightest is Mineral which is ideal for today’s more open office setup. The chair features details whose spirit began with Sarah chair. One example is the elimination of the hideous and hard to use recline lever found in La Z Boy and replaced with elegant sliders, which were carried over to Aeron. The chair comes with a twelve year warranty. This however, does not cover second owners and a list of other things. Herman Miller does not warrant scars or wrinkles occurring naturally in leather and veins, marks and cracks found naturally in stone. In addition it also does not warrant defects like colorfastness or matching textiles or from normal wear and tear. 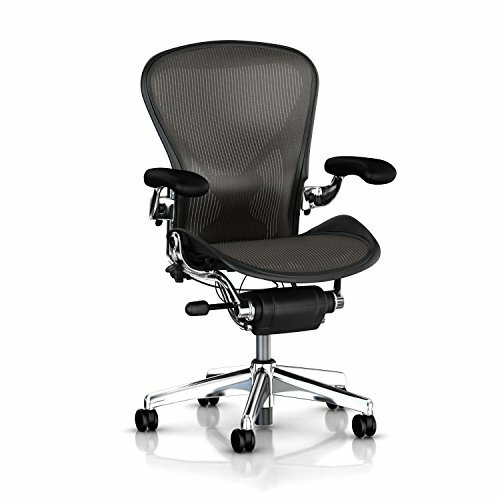 The Aeron chair has given birth to a number of task chairs for Herman Miller and it will continue to do so. TOPSKY is a well-known brand that specializes in modern home and office furniture. 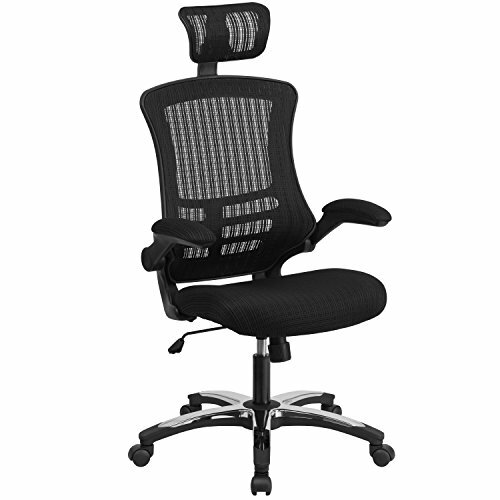 The TOPSKY mesh office chair specializes in ergonomics from top to bottom. With various features and even a hanger on the back for clothes and it’s easily one of the most comprehensive products in this category of low price ergonomic chairs. Speaking of the low price point, you can’t expect good features. TOPSKY doesn’t think so as it is set to show you that you don’t have to sacrifice either quality or features. This chair is equipped with a breathable mesh back made of high-density mesh which gives you air circulation in all conditions. It also has a thick sponge to keep you comfortable while sitting for long hours. This chair also has a clothing hanger in the back which is a very unique feature. It helps you to store your coat or a spare dress without getting wrinkled. TOPSKY chair includes a 3D adjustment headrest as it can be adjusted in height and angle to match your height. The lumbar support can also be adjusted in and out with a help of a knob on the exterior. The chair can swivel 360 degrees and has a tilt angle up to 145 degrees and can be locked at any position. The armrest moves up and down and allow comfortable seating to people of various height but does not adjust in and out which is the only drawback. An ergonomic office chair that offers more features and good build without compromising on the quality of materials that too on a budget is not at all an easy feat. 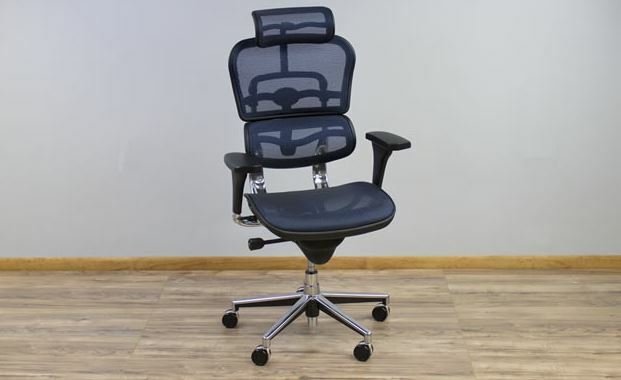 With a solid structure design and huge value for money aspect, the TOPSKY ergonomic mesh office chair becomes the choice for those looking for the bang for their bucks. Even though TOPSKY brand is relatively new it is a well-known among the target audience with a strong relationship with their customers whose feedback has been extremely positive. They have a global market for their products like the ergonomic mesh office chair as well as office desks and office furniture. TOPSKY has modern sleek design that mainly prioritizes ergonomics head to toe. With fully adjustable features with a unique hanger on the back, TOPSKY is easily one of the most comprehensive options on the market today. While most executive chairs traditionally have thick leather cushion to enhance the plushness and luxury feel, TOPSKY uses a high density breathable mesh for the back of the seat. This allows users to use the chair even in summer months where it’s hotter than usual. Product Dimensions: 24 inches deep x 26 inches wide x 44.5 inches in height. 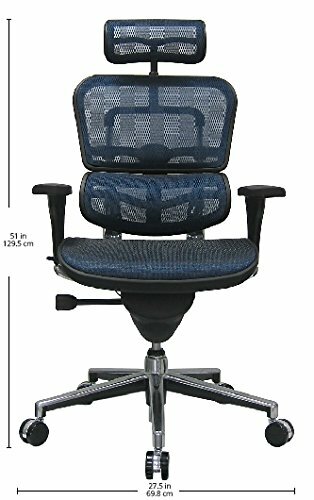 TOPSKY mesh ergonomic office chair with its sturdy skeletal back frame and high density breathable mesh, is very reliable and offers a decent build quality for the price. The chair is made of Thick plastic and composite materials. Since it a rigid back frame it’s great for people with heavy weight. Expecting great features at this low price isn’t a good idea or is it? Because TOPSKY begs to differ as it offers almost all the features of an ergonomic chair five times the price and much more. Hang it on the back: One of the very unique and distinct feature which is a clothes hanger at the back which is not seen often in other chairs. Most of the offices today are more open type and don’t have a separate space or cabin for all. In that case you will need a place to hang your important clothing (suit/ coat) or a set of dress for a party later on without it getting wrinkled. Now you have your own hanger in back of your chair. TOPSKY’s high density mesh takes the shape of your body and helps to regulate your temperature and is appreciated especially on days when climate is humid and hot. The three dimension (3D) headrest on the TOPSKY office chair is detachable and can be adjusted depending on you height and also can be angled. Another rare feature for a budget ergonomic chair is the lumbar support can be adjusted in or out to contour you’re back more precisely by rotating a knob on the back. The armrests are 3.5 inches in thickness and can also be moved up and down with a height range of 10-13 inches. These features allows people of various heights use the chair comfortably. 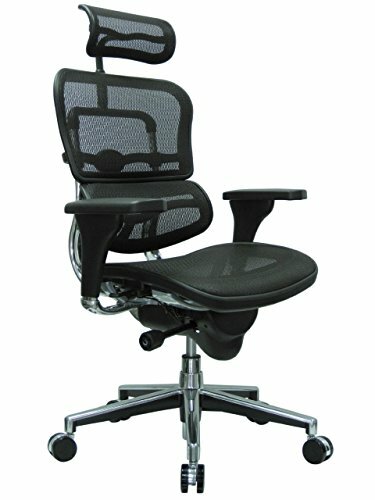 TOPSKY office chair also has the swivel and tilt feature which allows movement in the work area very feasible. The chair has a 360 degrees swivel and can tilt up to 145 degrees. There is also a locking mechanism which will allow you to lock the chair in place at any particular angle between the parameters. For a chair in the budget price bracket it has a decent warranty period of one year. While the mesh design may not be ideal for everyone. This chair and would fit well in home office or a contemporary office. The adjustable features of the chair provides a comfortable sitting experience for wide range of users and it is ideal someone who wants strong ergonomic features at a low price. This is one of the most popular chair and for good reason. It has a solid list of ergonomic features and it comes at a really competitive price. It’s been around for quite some time but back in late 2011, it went through a redesign. To start off, it has a height adjustable headrest that also pivots to fit the curve of your neck. The back is also height adjustable in four positions where you’re going to set the height of the back, which is also how you’re going to position the dynamic lumbar support. The arms have a ratchet height adjustment, so there is a lot of preset positions. You simply raise the arms and to lower them you should lift them all the way up and dropped back down. They are depth adjustable now and still pivot in and out. Another thing on this chair are all the controls are done by one lever, situated on the right side of the chair. It’s easy to control the chair without having to search around for the paddle your looking for. First off you flip it forward to adjust the seat depth. The height adjustment is done by simply pulling the lever up. The back recline is done by pulling the lever towards you and recline the back. Once you find a comfortable position you can even lock the backrest in that position by simply flipping it forward. It also has a safety feature, when reclined and when you want to bring it back to the normal position you need to flip the lever back but the backrest is not going to pop up. To release it you need to lean back in the chair to bring it to the normal potion. Another thing is the tension is controlled by a knob on the right. To increase the tension of the spring, rotate it forward and vice versa for reducing it. There are two versions of the chair V1 & V2. Both have similar features while V2 is sleeker and little smaller. Ergohuman is available in several different styles to choose from. It comes with full mesh design, a mesh back and leather seat design and an all leather design. Now all three styles are available with or without headrests as well. 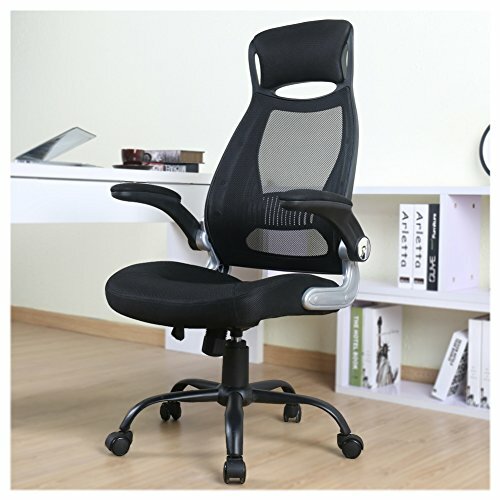 Ergohuman chair offers extraordinary comfort with unique styling and ease of use at an unbelievable price. It is for those who want to sit in style and expect comfort and support for all day use. Other than offering comfort seating with style, it fits a large number of body types. The Ergohuman series was launched by Neil Wu also the Founder & chief Designer of Comfort seating in 2005. The chair quickly gained popularity with its unique feature of one size fits all approach which is not even found in the benchmark chair, Aeron. Over the last decade it has been sold successfully in 52 countries. Over the course of time small changes have been made to improve the chair but the design has remained largely unchanged. 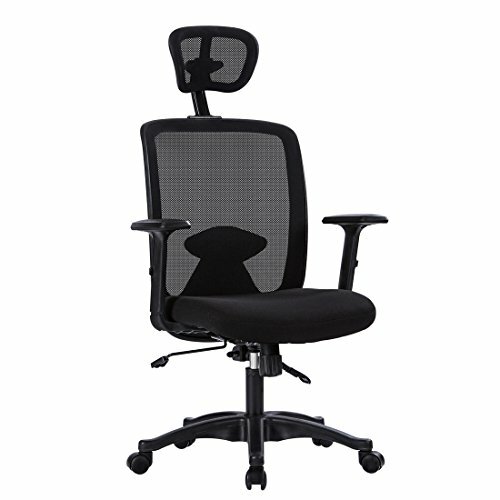 Ergohuman high back mesh chair has a strong set of ergonomic features with high back and headrest offering a stylish and contemporary profile that designed for extraordinary support and long-term comfort. This ergonomic chair is innovative featuring excellent lumbar support to the lower body and ease of adjustability at a great price-point. The chair is designed for all day use and versatility. 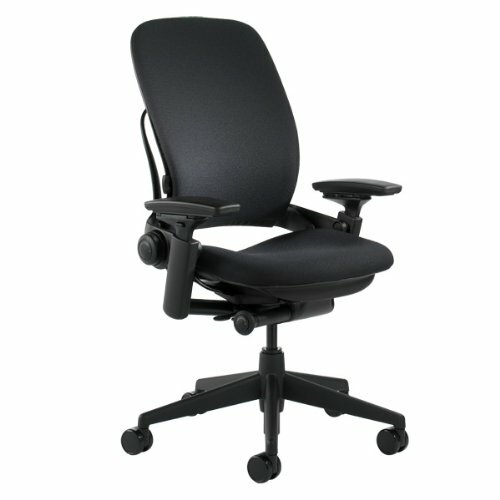 The chair benefits people looking for an easy to adjust ergonomic seating option that provides constant lumbar support. It also has user-friendly features, allowing for simple adjustments and ease of movement. 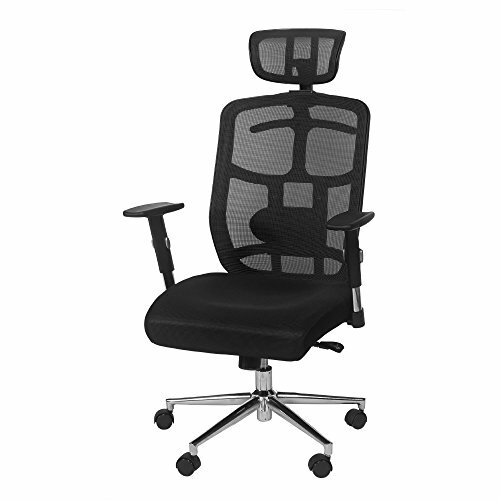 ME7ERG is a high back mesh model in a black frame with various colour option for the mesh back and headrest. The back angle adjustment with 3 position tilt-lock adjusts easily. Lock the chair back into place in any one of the three positions, using the tension control knob to control the amount of tension to recline or sit up straight. With the help of pneumatic cylinder you can easily raise or lower the chair quickly with ease. The backrest, seat cushion and headrest all adjust to accommodate and fit an array of users and their individual needs. Ergohuman chair’s another great feature is its lumbar support system which creates a lumbar that pushes forward than the rest of the back. It also auto adjusts according to each person so that the pressure applied depends on each person’s body weight. The advantage of having a mesh backrest is that it adapts to your body and flexes according to your lower back more than the padded one. The height adjustable lumbar support contours to the curve of the spine and provides comfort and support for a longer period. The headrest on the Ergohuman ME7ERG is quite different from the ones seen in other ergonomic chairs. It is a curved design that was intended to fit the curve of the neck and head, providing more support than the usual ones seen in vehicles. The headrest is height adjustable for approximately two inches. The headrest pivots at three points on the axis point at the end of the frame allowing it to adapt to your neck movements. Even though the arm pads are soft it still offers enough support while working for long hours. When not using the keyboard we generally rest our arm while only using the mouse. During this the arm pads arm pads are comfortable to lean into and can quickly regain its original shape while switching positions. The armrest is adjustable to find your comfortable position as they move forward and backward and in height. The armrests pivot inwards as well as outwards. Since they can be adjusted in depth, it is much easier to get close to your work area. The Ergohuman high back office chair comes in three different models and six different colours. The all mesh and the most popular model is ME7ERG. The one with leather seat and mesh back is LEM4ERG. The all leather model is the LE9ERG. The popular mesh version particularly comes in six different colours like all black [BLK], plum red/black [KM12], orange/black [KM13], green/black [KM14], blue/black [KM145], grey/black [W09-53]. This a nice collection comprising wide range of colours and models to choose from. Every Ergohuman product is backed by a great warranty. 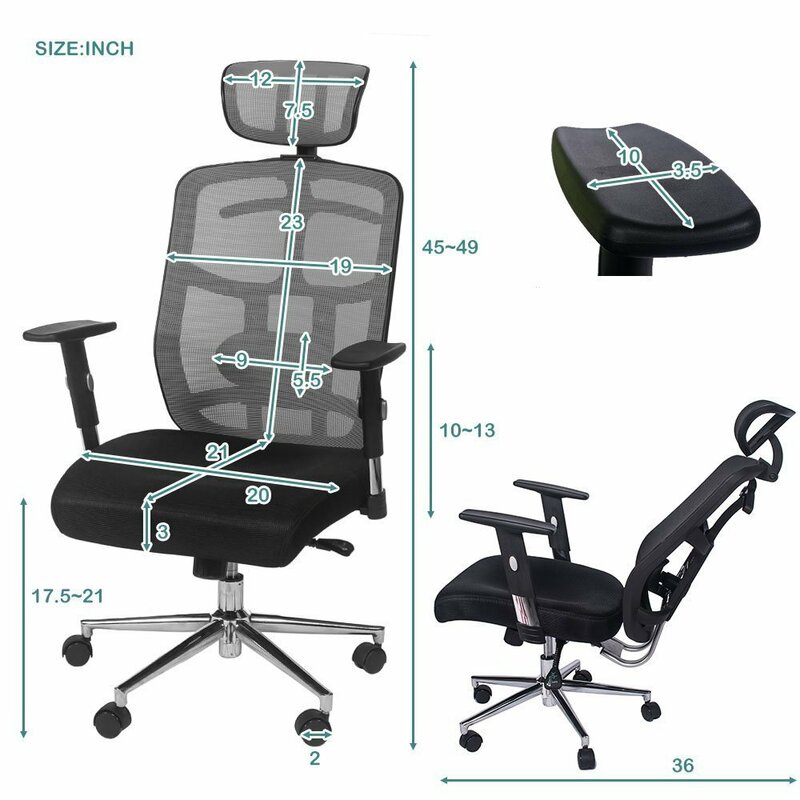 The model ME7ERG high back mesh chair is the best seller among the three models. It is backed by a warranty that covers all working parts for the lifetime of the product. If you purchase the Ergohuman chair from an authorized dealer which will ensure full Raynor warranty support. As long as you are the original purchaser of the product and hold onto the proof of purchase they send out replacement parts even 4. when the chair is over ten years old. There is difference in shipping of various models as standard models ship within a day or two while others take a little longer. Shipping is done from warehouses in California, Maryland and Texas. Assembly time usually take 10-20 minutes, depending on your skill level. The tools whichever required for assembly is included with the chair and it is recommended that you have assistance while attaching the chair to base since it’s a heavy. With a mesh seat, flip up armrests and a chrome plated nylon base this chair gives a contemporary appearance. The comfortable mesh seating allows you to be more productive with its comfort and ventilated design and a breathable mesh material circulates the air while sitting. The high back design relieves tension off the back and headrest adjust up and down by pulling the center knob. The tilt mechanism allows the chair to rock and recline for a comfortable position. The chair can swivel 360 degrees and the flip up armrest gives a way to use the chair in an armless way without giving the hassle of detaching them. The waterfall front design relieves pressure from the legs and the pneumatic lever adjusts the chair to the desired position easily. AmazonBasics is Amazon’s own brand which is in its infancy. 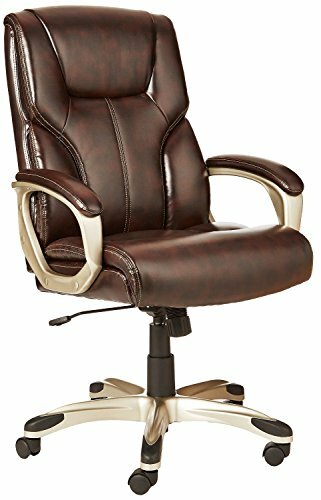 With products like the high-back executive chair, it shows it’s serious about bringing out quality products at a bargain. The high-back executive chair is not really an office chair as the Aeron or others because it focuses more on plushness and luxury than ergonomics but it does have a few ergonomic features. The chair is well designed and provides ample back support to sit. The leather is high quality and molded over a curved frame. It’s firm enough to provide lumbar support and soft enough that it doesn’t cause any pressure points. The AmazonBasics high-back executive is adjustable in height and tilt which should get you the desired comfortable ergonomic seating position. Instead of a tilt lock, this chair has rather a different feature called tilt tension. Tilt lock allows you to lock the chair in the desired angle whereas the tilt tension allows you to adjust the spring rate at which the chair is tilted which also achieves the desired function relatively well. GT racing chair is quite simply made for those who prefer style over function because they look absolutely stunning, similar to the racing seats made by the famous seat brand Sparco. This multifunction racing chair is also ergonomically designed as its comfortable to seat all types of body frames. The chair is made of metal frame and artificial leather hence its easy to clean. 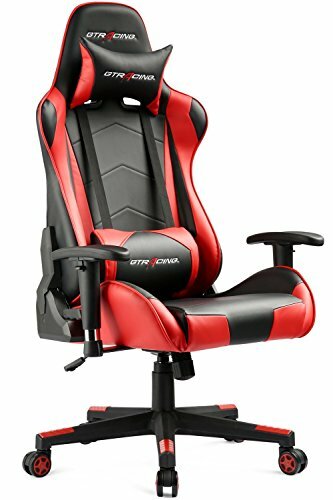 The chair comes with a removable neck and lumbar support pillows which make it an ideal choice for gaming, work, studying etc. By pulling a lever on the right, you can adjust backrest which has a safety angle of 90-170 degrees and it can go all the way back just in case if you’re deciding to sleep in it. The chair also comprises of height adjustable armrests and it can swivel 360 degrees with a sturdy five-point base which is built with heavy duty smooth rolling casters. The GT racing chair comes with a one year warranty as well. Space seating professional air grid office chairs also known as 5500 series, comes in three different styles. It comes with state of the art design and attractive price points. Featuring an innovative design with a clean appearance and fluid lines this series is sure to complement any work environments. Available in three styles the 5500 features a flow-through air grid back and padded mesh seat. The 5700 features a flow-through air grid back with a padded leather seat. The 5560 offers comfort with flow through seat and back, featuring a two to one mechanism tension control adjustable seating, the 5500 series chairs offer lasting comfort. For additional ergonomics, these chairs come with built-in lumbar support, adjustable armrests and 250 pounds weight rating backed with an industry-leading space lifetime warranty. You can flip the arms up and use it as an armless chair and also slide the chair under the desk to save more room space. The chair rocks and forth with help of a tension controller through which you can control the spring rate of the rock and forth movement of the chair. By pushing the lever on the right back you can lock the chair and by pushing it forward you can release the lock of the chair while rocking and forth to get the desired ergonomic position. Pulling the same lever, up you can adjust the height of the chair up and down. The chair is equipped with a wide headrest and an integrated mesh back frame and suitable lumbar support. The chair can swivel 360 degrees and based on a five-point base with well-built casters. The Longem office chair is created ergonomically to support a healthy circulation of air with its bungee padded mesh design all through. The headrest can be adjusted for height and angle. 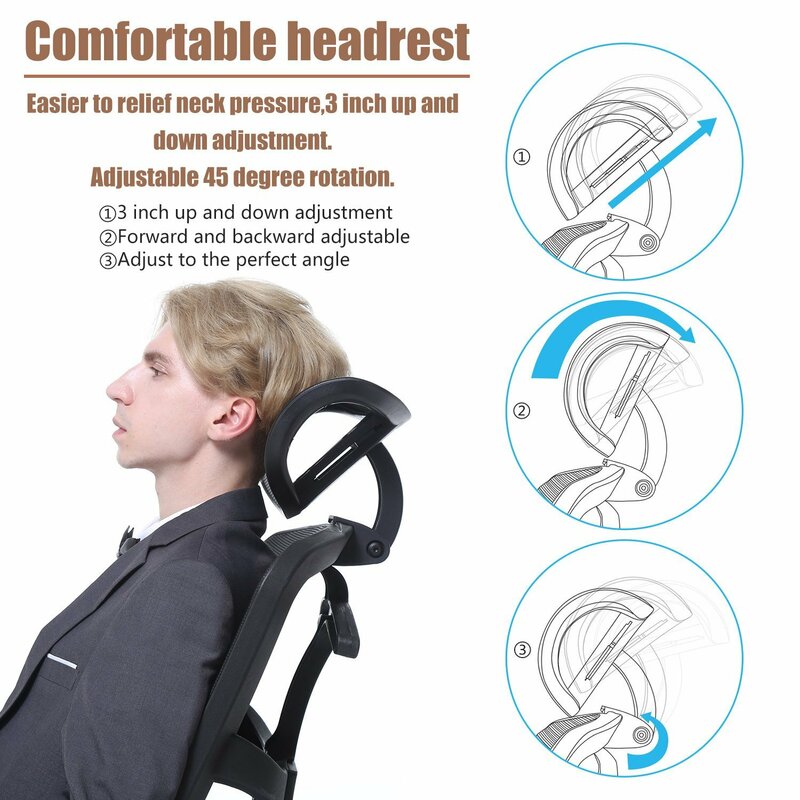 It adjusts its three angles with a click while it has a button on the back, for adjusting the height of the headrest up and down to fit snugly against the curvature of the neck and relieve the pressure. The armrests are height adjustable and can lock in three positions by pressing the button on each armrest. However, they don’t adjust for in and out position. There is a lever on the right with which you can adjust the height on the chair by pulling it up. It has also got a tension controller knob with which you can adjust the reclining motion by adjusting the spring rate and rock and forth between 90-120 degrees. There is a lever on the left which locks the chair in the desired position. It has a knob with which you can adjust the lumbar support by rotating it. With a strong nylon mesh back and well-padded mesh seating it allows you to sit comfortably for long hours. It can swivel 360 degrees and has smooth rolling casters and a class three gas lift for ease of function. Watch the following video for reviewing the office chair. Leap is a chair that actually changes shape to mimic and support the movement of your spine. The height of the seat adjusts to maximize comfort which is done by pulling the lever up on the right side of the chair. Adjustable seat depth accommodates different leg lengths and to provide better support for your lower back. It is done by lifting the paddle on the left up and moving the seat forward and backward until finding a comfortable position. The chair has flexible seat edge to release the pressure on the thigh and knees. You can recline with the help of a backstop feature and set the various degrees of recline by simply clicking paddle on the right through five different backstop settings. Adjustable back tension is controlled via a knob and it allows you to control the resistance when you recline. Turn the tension knob forward to increase tension and vice versa to decrease tension. The lower back firmness gives you constant support of your lower back and helps maintain the natural curve of your lower spine. Turn the knob situated on the back forward to increase firmness and backward to decrease firmness. The lumbar provides additional support to your back. Lean forward and slide the handles up or down to set the lumbar in the desired position. The armrests move independently so you can customize the fit for each side. Squeeze the button on the arm cap to raise it or lower the armrests. You can adjust the arm width, depth, and pivot by pushing the arm cap forward or backward, in or out and side to side. Once you have chosen the correct chair it’s also best to know the correct posture to sit once the workplace has been set up then the worker can adjust the chair to his/her physique. Following are the guidelines. Elbow: Sit comfortably and as close as possible to the desk. In this position make sure your spine and upper arms are parallel to each other. Adjust the position of the chair so that your hands rest on the desk with your elbows at a ninety-degree angle to the spine while your wrists are flat while typing. Thigh: Once you are in a comfortable seating position, make your thighs are in the right posture. You can check this by sliding your finger easily under your thigh and the leading edge of the seat. If its too tight then you need to adjust the position of your feet with a help of footrest. In case you’re too tall and there is an adequate gap between thigh and seat edge you need to adjust the posture of the chair, if not increase the height of the desk. Calf & lower back: When your back pushed against the back of the chair, fold our fist and reach in between calf and front of the chair. If you can’t do it easily, then the chair you’re sitting is too deep and you might have to address it by adding a lumbar support or a pillow. This causes your lower back to arch slightly so that you don’t slouch down or forward. This lower back support reduces the strain on the back especially lumbar discs. Armrest & eye level: Adjust the chair’s armrest so that it lifts your arm up at a shoulder level this should make you less likely to slouch forward. Maintaining a good eye level is very important to the sight as well as upper back. Sit in a comfortable position and close your eyes, when you open them your gaze should be aimed at the center of the monitor screen. If the gaze is either upper or lower part of the screen you should adjust the monitor screen immediately. If not in a proper position both armrest and eye level can affect the upper spine. Quite simply yes kneeling chairs are good for your lower back pain as they have a special type of coaster made to support people with coccyx(Tailbone) problems. These coasters are made up of normal foam if you are on a budget or available in memory foam. So when you sit on the chair it automatically opens up the angle of the hips so you’re more naturally sitting right down onto your sitting bones and the knees are lower than your waist. This helps to create a much better posture through the spine throughout allowing you to sit in a better position a lot more naturally, which helps to maintain the correct curve in your lower back taking the strain of that area. A common mistake people think is that they look at the kneeling pad and think that they need to lean their whole body weight forward on to that. If you do that over a long period of time you’ll feel pressure and soreness into the shins you’re also leaning and reaching forward with your back which is making your muscles in your back do a lot more work. The kneeling pads are there just to provide comfort and little support but when you sit properly on the kneeling chair, you should feel a little weight through your feet as well. Warranty differs with the manufacturer as each has their own policy. So when you’re buying an ergonomic chair it’s better to get the ones with better quality and warranty even if they cost a bit more because the cheap might get faulty over a period of time and need replacement or repairs which will end up costing you more. Even if you’re on a budget choose the one with more warranty. Each chair has its own weight capacity tested and specified in the brochure. Check the specification of the chair thoroughly before buying as weight capacity differs for each and every chair based on their build quality.